The St. Luke’s Women’s Group will meet Friday, July 13th in the Davis Room of the Parish House from 7 – 9pm. 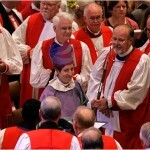 Join St. Luke’s Rector, The Rev. John Mennell, at 11:30 a.m. as he discusses the vision of St. Luke’s as we move forward. Come to hear about where we’ve come from, where we’re going, and how you can be a part of the progress we continue to make. For more information, email John at Mennell@slechurch.org.